In the reitroduction project of the Short-tailed Albatross into Ogasawara Islands, first two of the 15 chicks that had been transported from Torishima Island to Mukojima Island in February 2011 and had been being hand reared fledged on 12 May, 2011. Our English web site has been updated with new design now. We hope our web site will be helpful for foreign readers. Yamashina Institute is awarded 2010 Recovery Champion Award by US Fish and Wildlife Service (USFWS). This award is to honor USFWS staff members and their partners-in-mission for conserving endangered species. 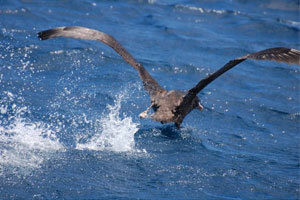 YIO is awarded for the conservation activities of the Short-tailed Albatross, and is among 29 recipients of 2010. As reported in media reports, Tohoku, or north-eastern part of Honshu, the main island of Japan, was struck with a devastating earthquake and tsunami on 11 March. Thank you to those of you who made warm inquiries asking for news of our safety. In the Yamashina Institute for Ornithology, in Abiko, Chiba Prefecture in central Japan, no one was injured. Many files and documents dropped down to the floor and some shelves tilted. However direct damage to the specimen, literature, and other research resources was minimal. In the reitroduction project of the Short-tailed Albatross into Ogasawara Islands, a three year old male (Y01) which was transported from Torishima, and hand reared and fledged from Mukojima in 2008 came back to the site of reintroduction on 10 February 2011. Because there has been no previous information whether this species will return to the site when transported from the natal place, we had not been completely confident about the success of our project. With the return of this immature bird, we are more confident that our method will work and the project will be successful. This reintroduction project is conducted by YIO in collaboration with Ministry of the Environment, Japan and United States Fish and Wildlife Service. On 8 February 2011, 15 Short-tailed Albatross chicks were transferred on helicopter from Torishima in Izu Islands to Mukojima in Ogasawara Islands. The transportation is conducted with the aim of reintroducing this endangered species to Ogasawara Islands for a more secure recovery. The chicks will be hand reared by the research team of Yamashina Institute camping in this uninhabited island until they fledge in late May. This is the fourth year of transportation which started in 2008 and is planned to last for 5 years. We have disclosed the Specimen Database English version online.